Not all medical practices chose a new health insurance plan by January 1. Perhaps your practice has a group policy that renews at some other point during the year. When you receive renewal paperwork, you may find alarming premium increases and other plan changes. Small to mid-sized medical groups may especially feel disadvantaged, since they do not have the bargaining power of a large hospital when it comes time to purchase insurance, and they likely do not have the time, manpower, or resources to examine each possible health insurance option thoroughly. If this is the case with your practice, you don’t have to go it alone. TMA Insurance Trust was founded so that TMA’s 50,000 members have options. We want to help you find a comprehensive yet cost-effective group coverage for your practice. Based on this information, your advisor will tailor a no-obligation recommendation for your practice. If you choose to enroll in the plan, your advisor will continue to support you during and after the enrollment process: answering questions, issuing ID cards, and helping with the day-to-day administration of the plan. You are likely aware that some insurance brokers work on a commission-based system, so their recommendations may fit their own best interests, not yours. Your advisors at TMA Insurance Trust aren’t paid on commission; they work for the Texas Medical Association Insurance Trust, not any insurance company or brokerage firm. Because of this, you can be sure that their recommendations are unbiased and are truly the best options available. Best of all, the entire service is offered to TMA members as a complimentary benefit of their membership - you pay nothing for the services. Once your group plan is up for renewal, by law, your insurance company does not need to give you more than 60 days to review the policy. If you don’t make changes during that time period, your plan will renew, but you probably won’t have the same coverage and benefits. Since plans and prices change every year (some significantly), it is important to review your plan thoroughly when it comes up for renewal. If your plan auto-renews and the new coverage doesn’t suit your practice's needs or budget, it could ultimately create a financial strain on your practice. It is to your advantage, then, to contact TMA Insurance Trust as soon as you receive your renewal. Your advisor will conduct a thorough review of competitive plans, giving you and your practice manager options that can manage overhead and control benefit costs. By contacting TMA Insurance Trust as soon as possible, you’ll have enough time to decide which plan is best for the health of your practice and make the necessary changes before the deadline. Not only are our advisors non-commissioned, they have decades of experience in the medical insurance field, matching Texas physicians with the health insurance coverage that meets their individual needs. We understand you like no other insurance agency does, and we’re proud to say that more and more physicians are choosing us to care for their insurance needs. In the past two months, we’ve been pleased to welcome over 120 new medical practices across the state to TMA Insurance Trust. 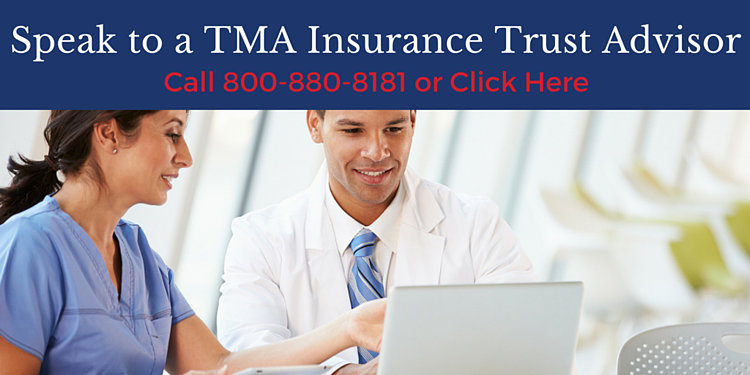 TMA Insurance Trust wants to save your medical practice time and money. Are you paying too much for your employee health plan? Are you getting the best possible coverage? For your own peace of mind, we encourage you to contact us for your free, no-obligation quote as soon as you receive a renewal notice from your provider.